Our home in France is located in the Cote Azur, in the charming village of Valbonne. We are 20 minutes from the Nice airport. 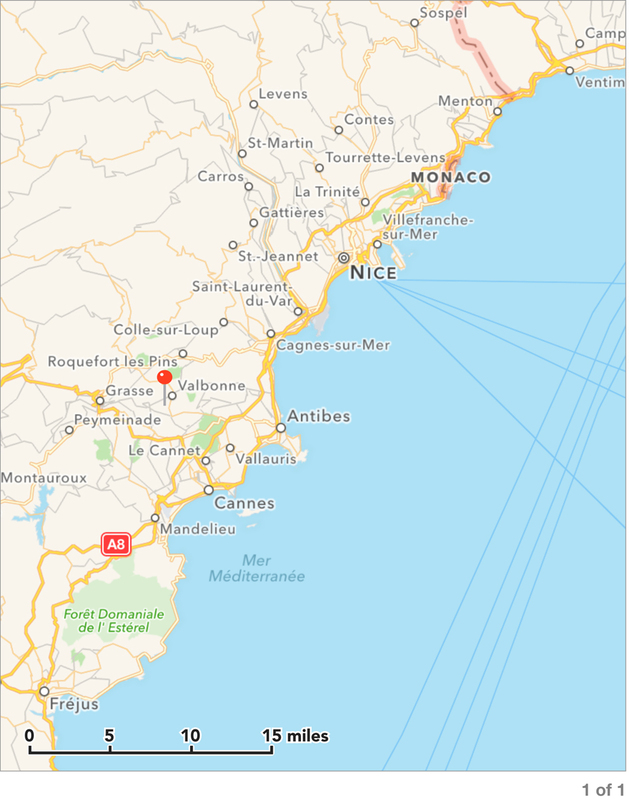 Cannes is 15 minutes away, Monte Carlo is 45 minutes and Italy is an hour. There are wonderful perched villages to visit, it has been the home of Renoir, Matisse, Chagall and Picasso to name only a few. There are numerous golf courses, wonderful restaurants and incredible shopping. The house was completely gutted and remodeled in 2000. We have four bedrooms each with their own bath room, all have individually controlled air conditioning. Two of the bedrooms are master bedrooms, with large bathrooms with both a large stall shower and a tub, two sinks and a separate wc and bidet room. Both have king sized beds. The other two bedrooms have two beds each which can be pushed together as king size beds or used separately. These two bedrooms each have bathrooms with stall showers. There is a large living room with a fireplace, a dining room that seats ten, a charming kitchen with a French commercial stove, two refrigerators dishwasher and microwave, and another separate sitting area. We have several eating terraces and a heated swimming pool. The views of the mountains are lovely from everywhere on this very private property. Even the driveway is pretty, as it is paved in limestone pieces. There is television, stereo, wi fi internet connection with a printer and a scanner are available. All the linens are included and abundant. We include our housekeeper once a week. There is a washer and a commercial dryer. There is also a gas barbeque. There is a toilet area out by the poolhouse, and an outdoor shower. There are extensive gardens and 15 olive trees. All the outdoor areas have appropriate furniture. The house is situated in a private gated domain and our property is also fully fenced and gated. It is walking distance to the village. There is a beautiful square in the village with several restaurants and on Fridays there is a typical provencal market. It is an active village but it is not a tourist village teaming with people. There are many evenings that have music in the square. Mougin is 8 minutes away with its many award winning restaurants. You will certainly never go hungry in France!